Era mais um dia tranquilo quando recebi um email do "Atelier Brasil Goulart" sobre uma nova coleção a respeito do Tao e do Ving Tsun (Ou Wing Chun). Em anexo no email, havia o portfólio desta coleção com algumas artes sensacionais, tendo estas duas manifestações da cultura clássica chinesa como tema. 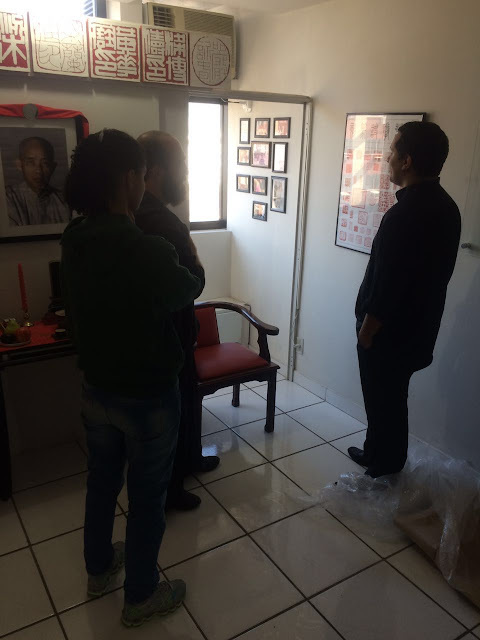 A partir dali, aconteceu uma troca de emails , e finalmente foi agendada uma visita do artista Brasil Goulart (foto) ao Núcleo Méier. Na ocasião, acompanhado de sua esposa, o artista me presenteou com a incrível obra de arte personalizada com a "Mui Fa" ('Flor de Ameixa' usada como logo em nossa escola) intitulada "Butterfly Knives". It was another quiet day when I received an email from "Atelier Brazil Goulart" on a new collection about the Tao and Ving Tsun (or Wing Chun). Attached to the email, was the portfolio of this collection with some sensational arts, having these two manifestations of classical Chinese culture as its theme. From there, there was an exchange of emails, and was finally scheduled a visit of the artist Brazil Goulart (photo) to the Moy Yat Ving Tsun Meier School. 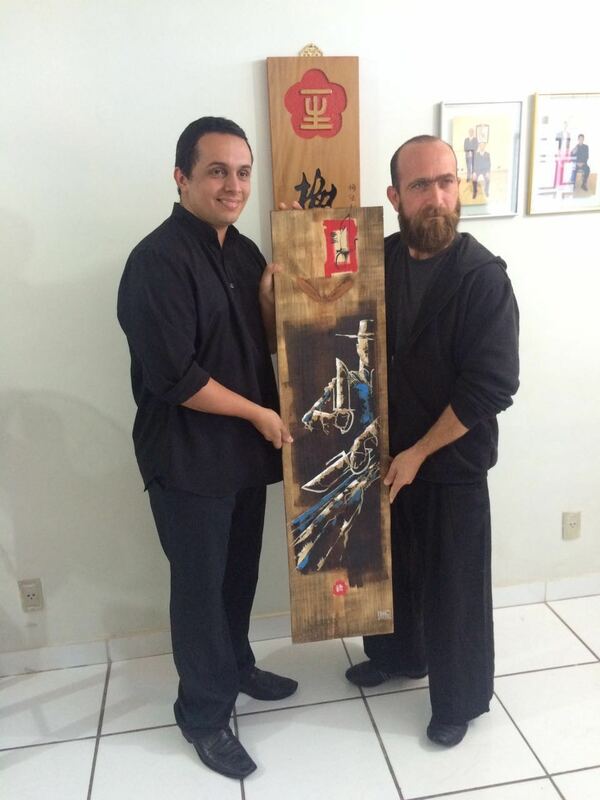 On the occasion, accompanied by his wife, the artist presented me with the incredible personalized artwork with a "Mui Fa" ('Plum Blossom' used as a logo in our school) entitled "Butterfly Knives". 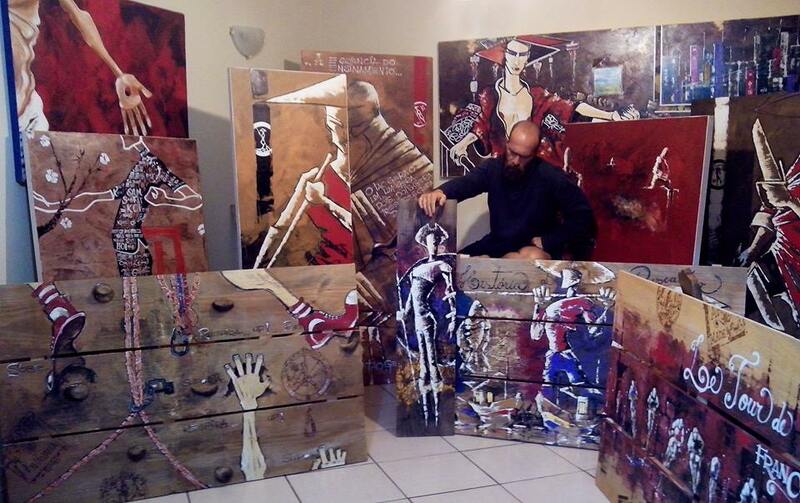 (In this artwork by Brazil Goulart called "Red Junk Oarsman"
Brasil Goulart é uma pessoa muito cortês e simples e fala de arte com muito amor e sentimento. Sua tranquilidade e cortesia , nos fazem as vezes nos esquecermos que estamos diante de um artista capaz de trabalhos como este acima. Brazil Goulart is a very courteous and simple person and speaks of art with great love and feeling. His tranquility and courtesy, make us sometimes we forget that we are facing an artist able to do works like this one above. Aproveitei para apresentar o Mo Gun , seus objetos e o pensamento por detrás da organização ao artista e sua esposa. E fiz o meu melhor para falar do "Ving Tsun Kuen Kuit Suen Hak" . Projeto que traz o nome de Mestre Leonardo Mordente à frente , no qual a ideia é permitir que os descendentes da Linhagem Moy Yat tenham acesso a obra de arte de mesmo nome, feita pelo Patriarca desta Linhagem em diferentes fases. Sobre isso, ficou combinado entre o Clã Moy Jo Lei Ou e o artista uma apresentação sobre o Ving Tsun Kuen Kuit em Dezembro na cidade de Angra dos Reis durante um mês de exposição de suas obras. I took the opportunity to present the Mo Gun, its objects and the thinking behind the organization to the artist and his wife. And I did my best to talk about the "Ving Tsun Kuen Kuit Suen Hak". Project that bears the name of Master Leonardo Mordente ahead, in which the idea is to allow the descendants of the Moy Yat Lineage to have access to the same name work of art, made by the Patriarch of this lineage at different stages. On this, it was agreed between the Clan Moy Jo Lei Ou and the artist a presentation on the Ving Tsun Kuen Kuit in December in the city of Angra dos Reis for a month of exhibition of his works. Com perguntas elaboradas pela Discípula de Mestra Ursula Lima , Helena C Ribeiro, que é formada na Escola de Belas Artes. E outras que decidi fazer na hora. Uma entrevista foi realizada com o artista , que gentilmente respondeu perguntas sobre sua carreira e a decisão de fazer uma coleção sobre Ving Tsun e o Tao. Esta entrevista marcará também o retorno do programa "Cultura Kung Fu" no youtube em Agosto. With questions drawn up by the Disciple of Master Ursula Lima, Helena C. Ribeiro, who graduated by School of Fine Arts. And others decided to do at the time. An interview was conducted with the artist, who kindly answered questions about his career and the decision to make a collection of Ving Tsun and Tao. This interview will also mark the return of the "Kung Fu Culture" on YouTube in August. 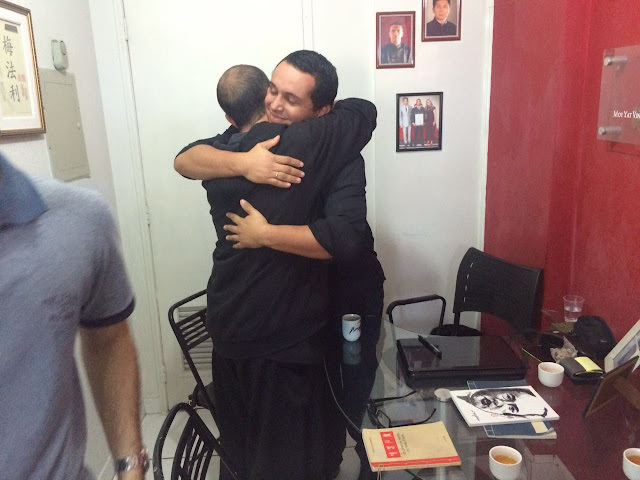 Essa importante visita cria laços entre o Ving Tsun e outras manifestações artísticas. O que mostra mais uma vez, que os movimentos corporais de combate simbólicos trabalhados em nossa arte. São apenas o início para outras formas de se desenvolver como ser humano. This important visit creates links between Ving Tsun and other artistic manifestations. This shows once again that the body movements of symbolic combat worked in our art. They are only the beginning for other ways to develop as a human being. Para contatar o Artista Brasil Goulart(foto), você pode "curtir"
A NEW MOY YAT VING TSUN SCHOOL IN RIO!